Hamann's writing is strongly concerned with entering into a dialogue with the reader, and this is demonstrated by examining his use of intertextuality, his epistolary conversations, and his use of metaphor and rhetorical devices. In this, the idea of condescendence is a central influence on Hamann's work - just as God reveals himself in nature, history and the word in order to establish a relationship with humans, Hamann wishes to enter into a dialogue with his contemporaries. Diss. phil. 2004 bei Prof. Dr. Alois Haas, Zürich. 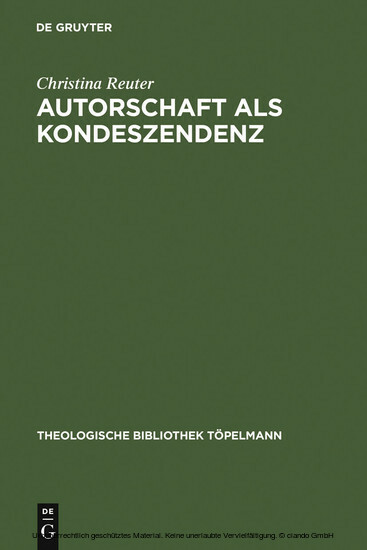 Christina Reuter ist jetzt Wissenschaftliche Mitarbeiterin bei der historisch-kritischen Edition Johann Caspar Lavater (Theologische Fakultät der Universität Zürich).